How do we know when we are entering a new computing era? One signal is a reemergence of grassroots innovation. Early in a computing era most technical development resources are still focused on sustaining the mature applications and use cases from the waning era or on exploiting attractive transitional technologies. The first explorers of the technologies of a new era are rebels and visionaries operating at the fringes. These explorers naturally form grassroots organizations for sharing and socializing their ideas and accomplishments. Such grassroots organizations serve as incubators for the the technologies and leaders of the next era. 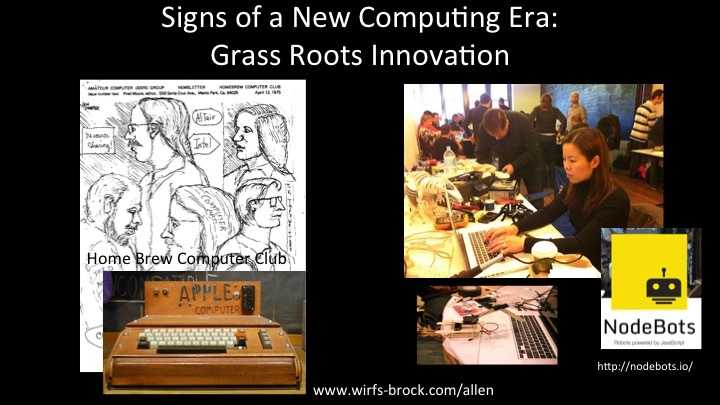 The HomeBrew Computing Club was a grassroots group out of which emerged many leaders of the Personal Computing Era. Now, as the Ambient Computing Era progresses, we see grassroots organizations such as the Nodebots movement and numerous collaborative GitHub projects serving a similar role.